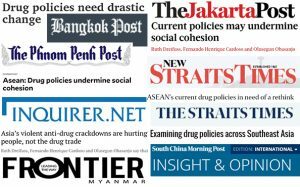 Global Commissioners and former presidents Ruth Dreifuss of Switzerland, Fernando Henrique Cardoso of Brazil, and Olusegun Obasanjo of Nigeria, publish an opinion piece on drug policy reform in Southeast Asia in eight major papers, in ASEAN countries (Cambodia, Indonesia, Malaysia, Myanmar, the Philippines, Singapore, and Thailand) and Hong Kong. With regional and international heads of state gathering in Manila, the Philippines, for the 31st Asean Summit, which kicks off on Friday and runs through Tuesday, it seems appropriate to examine whether or not there are more effective drug policies than those currently at play in dealing with the harms caused by the presence of drugs in society. Addressing drugs and their potential harms is the responsibility of states and governments. The way they decide to approach drugs and the policies they put in place are nevertheless the concern of all citizens, their representatives in Parliament, and their civil society movements.